Looking for the hoards of gold and jewels in the dragon’s lair? Be prepared to face the wrath of the Remote Controlled Dragons! This legendary beast walks across the floor with its eyes lit up and giving a fearsome roar! Realistic walking motion with natural head and neck movements also bring this mythical Dragon to life! Ages 3+…. This toy costs approximately £19.99 (for the latest and best prices make sure you check our retailer list for the Remote Control Walking Dragon above). 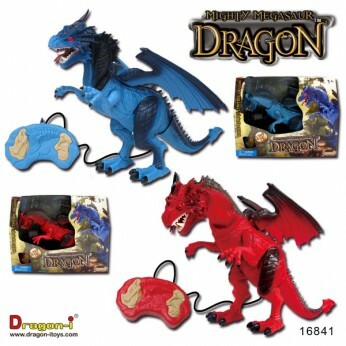 In our review of Remote Control Walking Dragon we classed it as being suitable for ages 6 years, 7 years, 8 years but recommend you check the manufacturer specific advice before purchasing.